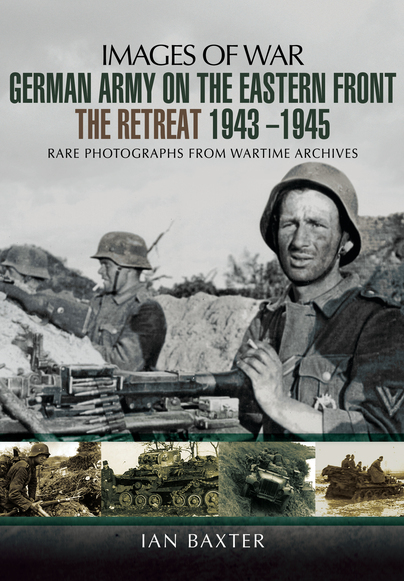 You'll be £10.50 closer to your next £10.00 credit when you purchase German Army on the Eastern Front - The Retreat 1943 – 1945. What's this? After the defeat at Stalingrad in January 1943, the German Army’s front lines were slowly smashed to pieces by the growing might of the Soviet Army. Yet these soldiers continued to fight gallantly. Even after the failed battle of the Kursk in the summer of 1943, and then a year later when the Russians launched their mighty summer offensive, code names Operation BAGRATION, the German Army continued to fight on, withdrawing under constant enemy ground and air bombardments. As the final months of retreat were played out on the Eastern Front in early 1945, it depicts how the once vaunted German Army, with diminishing resources, withdrew back across the Polish/German frontier to Berlin itself. This very interesting book captures this retreat in a series of magnificent photographs. show many details not often seen elsewhere. Having previously read the book about the years of the German advance in Russia, I was keen to read this one that focuses on the years of retreat. The book contains many great images that I’d not previously seen showing the German soldier in the variety of uniforms, landscapes and weather conditions so typical of the mid to late war period. There is also a lot of focus on the artillery pieces used, and infantry weapons such as mortars, Panzerfauts and the STg-44 assault rifle. The book picks up as the battle of Kursk comes to it’s end in late Summer 1943 and the Russians begin the counter offensives which would drive the Germans all the way back to Berlin. Each section of pictures is prefaced which insightful copy from the author who describes the Summer & Winter battles of 1943, the retreat through and defence of Poland and so on. I felt some of the captions that sit with the pictures had an element of guesswork attached to them but on the whole as a pictorial reference guide with a narrative that sets the scene without being too complicated, I’d be more than happy to recommend this book. Beginning with the German defeat at Kursk in 1943, this photographic study goes on to describe the subsequent winter fighting and the catastrophic defeats of 1944, culminating in their collapse during the final year. Yet despite the increasingly hopeless situation, the photographs also reveal the relentless dedication and fighting spirit of the ordinary German soldier. The infantry and artillery receive the most attention, although some armour is present, including images of captured Russian tanks put into the service of the Wehrmacht. As with all books in the "Images of War" series, the superb photographs have been carefully selected to depict a wide range of situations, terrain, weather conditions, uniforms and equipment, and come with detailed captions. Included amongst these are images of observation posts, mortar teams, improvised river crossings, the construction of defensive positions with forced labour, and the impact of the scorched earth policy. The book is broken down into 5 chapters, each one introduced by a few pages of text which explain the background to each element and than a group of well captioned archive photos which do a good job in illustrating each one. The first chapter looks at the Summer and Winter Battles of 1943. While it has some shots of captured Russian equipment from the early success at Kursk this was turned around by a Russian army that had learned their lessons well from the first two years of defeats. For chapter 2 it moves on to the Winter Warfare of 1944 and then the Battle of Attrition of 1944 for chapter 3. Chapter 4 looks at Defending Poland before getting to the final stages of the war in the final chapter, Army in Retreat. The well chosen selection of photos offer a lot for modellers, perhaps one of the reasons for the popularity of the Images of War series among hobbyists. As the war moved on in these last three years there were changes to uniforms and equipment which are well illustrated. Among a number that could be picked out has to be the increasing appearance in many of the pictures of German troops armed with the Sturmgewehr 44 assault rifle. With longer range than a sub-machine gun but with greater firepower than a traditional rifle, close to half a million of these were made before the end of the war. Since WW2 the advantages of the assault rifle have made them common around the world, perhaps so well illustrated by the similar looking AK series. Add to this a good indication of the conditions that men were fighting in, the pressure caused by a lack of fuel supplies and a reliance on horse drawn equipment even at the late stages of the war. A natural companion to the author's earlier title and it does a good job of telling the story of German infantry troops in the final stages of the war.